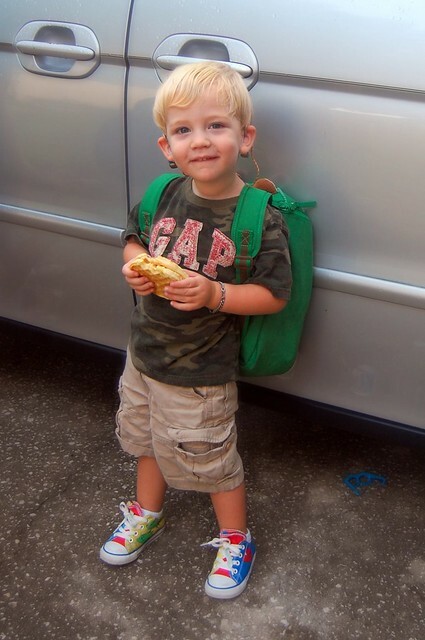 Seth just began his third year of preschool. While we are waiting on his placement at the school we moved here for, he is attending a local preschool here in town. Seth has always been a really shy kid. He's very attached to me in particular, and sending him off to school each year has been a big challenge. He's always been "that kid"...the one that is screaming outside the classroom while everyone else is trying to drop their kids off without letting Seth set their own kids off in a big bawling chain reaction. 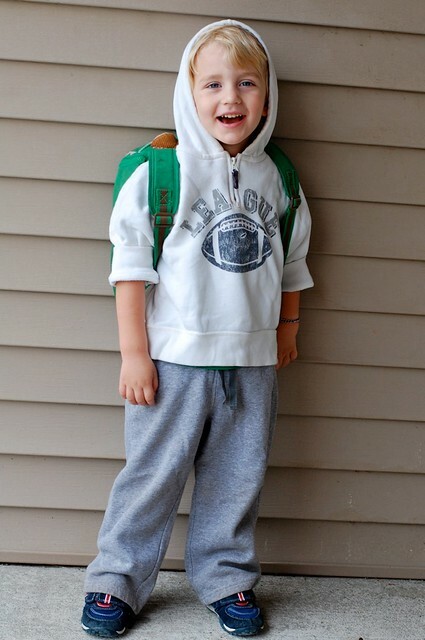 His first year in preschool he cried every. single. day. for the entire year. Last year he cried at drop off for the first half of the year. As Seth's understanding and language improved, I was able to work more with him on planning ahead. And last year we did a whole lot of work at school at getting him into the classroom appropriately and greeting the teacher, finding his name on the chart and putting his things away. We ended the year on a really high note and Seth was finally excited about school. Seth is extremely stubborn; he does things when he does them. Would his third year in preschool be the charm? After a summer off, I had no idea what to expect. Seth has really come out of his shell the past several months, so I had a feeling this year might be different, but I was still completely unprepared to pull up in car line, unbuckle his car seat, and stand there as my four year old grinned at me, yelled "Bye, Mom!" and ran off into the building without even a backward glance. I texted John: "Seth just ran inside the building happily. He didn't even look back. This has never happened...I don't know how I feel about this!" He texted back: "You're crying, right?" And now, back at home, my emotions are still all over the place. Seth has always been the child, out of all five, who has needed me the most. My other children are independent and social and have never felt even a qualm at heading off to school or church or wherever. I'm proud of that...proud that they feel secure leaving. I know that Seth gaining this confidence is a great thing and that it means we've done something right. But of course, I still cried. Happy tears at how he is growing up, sad tears at how he is growing up. I'm a girl, I can have conflicting emotions, right? 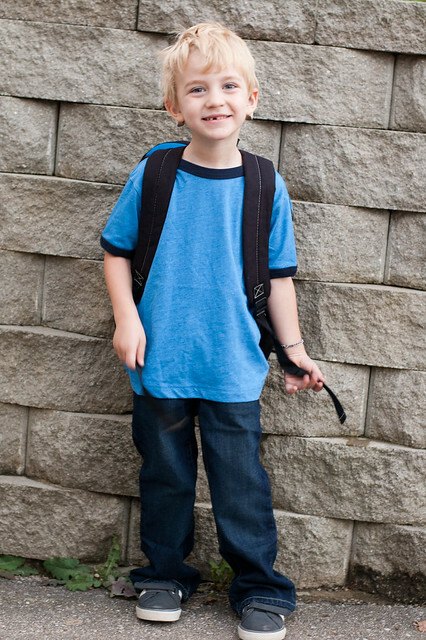 Here's Seth on his first day of school at 2, 3, and 4 years old.